Abby the Librarian: Happy Birthday to Me! 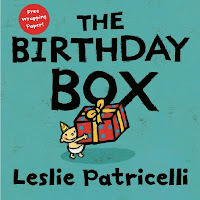 Today's my birthday and in celebration, I thought I'd share some picture books for a birthday-themed storytime! 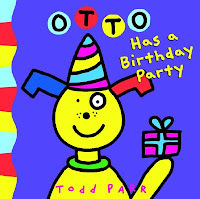 Otto has a Birthday Party by Todd Parr. I love the goofy humor and super bright illustrations in Todd Parr's books. In this one, Otto the dog throws a birthday party, but all the gifts he receives are not quite what he wants (underpants that are too small?! Yipes!). This is a silly book that will get the kids laughing! 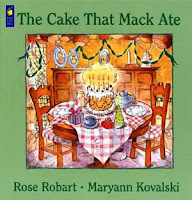 The Cake that Mack Ate by Rose Robart. A cumulative story that's a variation of The House that Jack Built, this story starts with the egg that went into the cake that Mack ate and continues all the way to the farmer's wife who baked the cake that Mack ate. A cumulative story is a great way to get the kids chiming in and the unexpected ending is a sure crowd-pleaser. 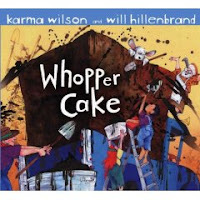 Whopper Cake by Karma Wilson. I'm sure I've mentioned my undying love for Karma Wilson, right? Well, Whopper Cake is another favorite. Unlike one of my coworkers who is creeped out by larger-than-life food, I really enjoy this story of a doting husband creating the world's largest cake for his wife's birthday. It's so big, they can't mix it in a bowl, they have to mix it in the bed of a pickup truck! And the fun doesn't stop there. It may be a little long for younger audiences, but the bright pictures and rhyming text make it great for storytime. I am Invited to a Party! by Mo Willems. Piggie is invited to a party, but she's never been to one before and she's not really sure what to expect. Luckily, Elephant knows parties and comes up with all kinds of outfits in case of any possibility. And when it might be a fancy party, a pool party, or a costume party, the outfits get pretty silly indeed! 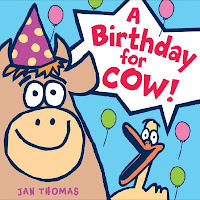 A Birthday for Cow! by Jan Thomas. Thomas, creator of the hilarious What Will Fat Cat Sit On? brings us another book sure to have them giggling. (Have you noticed that I prefer silly/funny books for my storytimes?) The animals are making a birthday cake for cow and duck keeps trying to add a special ingredient... Will cow like his birthday cake? Bright pictures and simple text make this a new storytime favorite for me. So, there you have several of my favorite birthday picture books. What are your favorites?? Hope your birthday is a wonderful one! So there are a few more ideas for you in addition to the fun ones you've already mentioned. Have a great day! PS I removed my previous comment because I wanted to hyperlink the link :). Happy Birthday!! We love I'm Invited to a Party, too... so much that we all have it memorized. :) Hope you have a good birthday! Good one! Birthdays are so special. My daughter will turn 13 this year and after going through this post I felt like my daughter will love it. I have booked one of the finest event venues Chicago for her birthday celebration and I still am thinking about the presents.